(19687.IO.OL.8.4, Chester R. Cowen Collection, OHS). (21719.15, Doresa Gray Collection, OHS). In the earliest days of the petroleum industry, from the mid-nineteenth century until the early twentieth century, the marketable products refined from crude oil were focused on kerosene and lubricants. Since that time the rise of the use of the internal combustion engine has made gasoline the primary product of the refining process. Because hundreds of types of hydrocarbons compose crude oil, those various materials must be separated from the crude by a refining process. Up until the mid-1940s petroleum products were refined by the relatively inexpensive fractional distillation process, a mechanical operation that involves heating crude oil. As it heats, its various hydrocarbon components, called "fractions," tend to boil at different temperatures. As the fractions boil off, vapors are recovered and distilled into liquids. The fractions that are recovered, from lowest boiling point to highest, include gases such as butane, then gasoline, kerosene, diesel, and finally heating oil and lubricants. Distillation produces approximately 40 percent gasoline from each barrel of crude oil. In order to increase the volume of gasoline to meet post–World War II market demands and to develop various other hydrocarbon-based products, refiners created a chemical process called catalytic (cat) cracking. Cat cracking breaks down various hydrocarbon molecule chains and transforms them into gasoline and other products, allowing a much greater percentage of gasoline to be extracted from each barrel of oil. Since its successful introduction shortly after the end of WWII, cat cracking has remained the primary method of refining crude oil in the United States. In Oklahoma the development of petroleum refining reflects both the discovery of new oil fields and the industry's changing technology. In the decades following the discovery of oil in the state, a tremendous number of small, inexpensive fractional distillation refineries were built. It is estimated that, over time, more than three hundred such refineries have operated. The first was constructed in 1905 near Muskogee by the Muskogee Oil Refining Company. By the time the huge Cushing Oil Field was discovered in 1912, thirteen refineries existed in the Oklahoma/Kansas region. 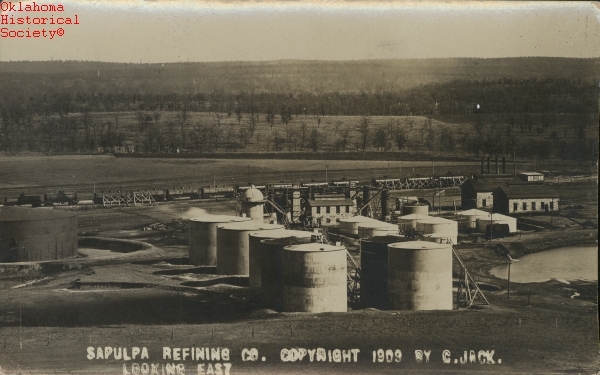 The glut of oil from Cushing made it difficult for producers to transport and market all their production, and many of them built their own refineries close to the field. When Cushing reached its peak in 1915, fifty-five refineries operated in the region. During the flush production of the 1920s the pattern of situating refineries adjacent to new oil fields continued, and the number of small independent refineries exploded. Most of them operated for fewer than ten years, although a few continued to thrive. In the 1930s petroleum production waned.The larger oil companies gradually absorbed most of the smaller refineries as they assumed control over the refining and distribution process in Oklahoma. In the decade of the 1950s the new cat cracking process came to the fore, and consolidation of the state's refining industry accelerated. Although newer refineries produced much more gasoline per barrel of crude oil, they were also much more expensive to build and operate. As a result, cat cracking units were usually added as upgrades to existing facilities. That activity continued the concentration of the refining industry toward larger, well-financed corporate entities. In Oklahoma a complex series of events caused the decrease in the number of refineries. Among them was the aforementioned expense of construction and operation, which, combined with the merger of several major oil companies, created a certain amount of downsizing. In addition, dwindling feed stocks of domestic oil meant that there was less to refine, and the refining industry to began to concentrate along the Gulf of Mexico coast in order to take advantage of imported foreign feed stocks. By 1963 only fifteen refineries operated in the state, and they processed a combined total of approximately 400,000 barrels of crude oil per day. By the year 2000 only six refineries still operated, but due to their expansion they processed approximately 500,000 barrels per day. In 2009 the refinery number fell to five when the Tulsa East and Tulsa West refineries were combined as one. In 2015 five refineries still operated in Oklahoma: The newest, a 14,000 barrel-per-day-capacity facility built in 1982 in Thomas, is operated by Ventura Refining and Transmission Company. The largest in capacity, originally built in the 1920s at Ponca City, produces 194,000 barrels per day and is operated by Conoco/Phillips. Next largest is the East (built in 1910) and West (built in 1913) Tulsa Refinery, processing 125,000 barrels per day and owned by the Holly Frontier Corporation. The Ardmore Refinery, built in 1913, processes 85,000 barrels per day and is owned by the Valero Corporation. Finally, the Wynnewood Refinery, built in 1923, processes 70,000 barrels per day and is owned by the CVR Energy Company. There are hundreds of abandoned refinery sites in the state. Most pose little environmental threat, although some have been deemed hazardous waste sites. A major, ongoing Superfund program attempts to remediate environmental hazard threats at the Hudson Refinery site at Cushing, the Imperial Refining Company site near Ardmore, and the Oklahoma Refining Company site at Cyril, along with several others. American Petroleum Institute, Petroleum Facts and Figures (New York: API, 1963). W. L. Leffler, Petroleum Refining for the Nontechnical Person (Tulsa: Pennwell Books, 1985). Oklahoma Department of Environmental Quality, 2003 Land Report: Remediation, accessed at www.deq.state.ok.us/pubs on June 1, 2015. Carl Coke Rister, Oil: Titan of the Southwest (Norman, Okla.: University of Oklahoma Press, 1949). 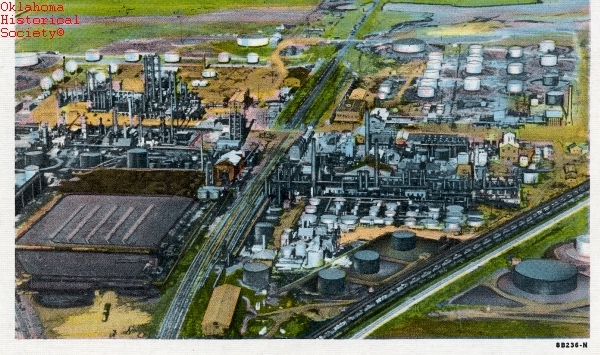 Bobby D. Weaver, "Refineries," The Encyclopedia of Oklahoma History and Culture, https://www.okhistory.org/publications/enc/entry.php?entry=RE039.